A small road off Highway 7. This is the last of three reports. Here are links to Report 1 and Report 2. In Sogndal, where we would remain for 5 days, we had a warm apartment that allowed us to explore the adjacent fjords and mountains without venturing too far. 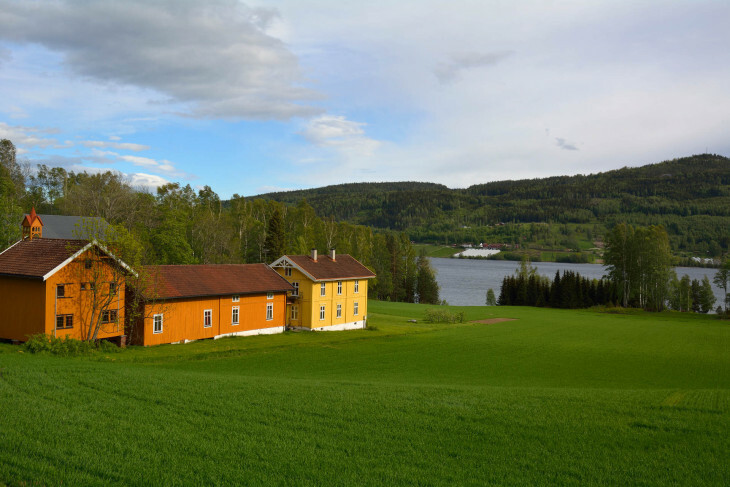 The weather would remain cold and damp, but we were determined to avoid a day on the bikes remotely like the punishing trip from Sandefjord to Fagernes. The first full day in Sogndal, we stayed in bed late, and then took a stroll around the small town. So different from Oslo, Sogndal has a population of less than 10,000 … even smaller when the 3,000 students leave school for summer break. Small shops and stores, including an indoor “Mall” necessary to shop comfortably during winter months (many Norwegian towns have a Mall for this reason), were all reachable by foot in less than 5 minutes. Coming from Southern California, it was nice to have everything so close to our front door. Even in this relatively remote location on the fjord, all the commercial establishments seemed well maintained. Nothing appeared run down, or abandoned. We felt a bit guilty not getting on the bikes that day, but it was a nice break. We were committed to exploring on the motorcycles the next day regardless of the weather conditions. This is the short, twisty road (338) near Sogndal that provided a rare bit of traction for some fun on the bikes. The following day was mostly dry, but overcast. 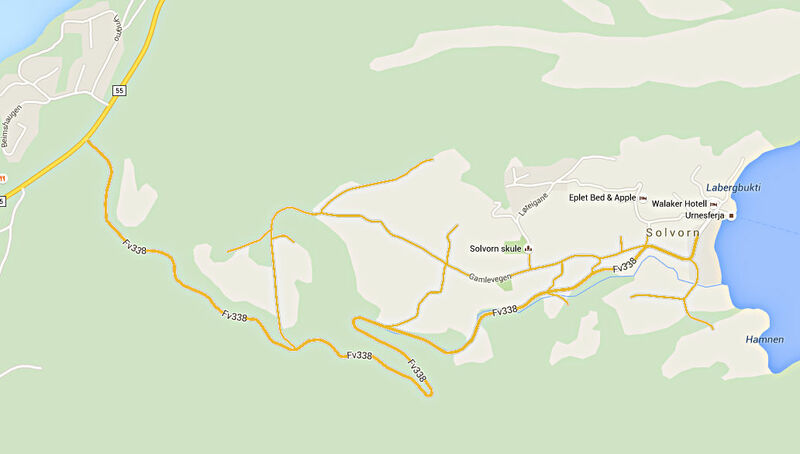 We started with a trip south on the 55 highway that stayed at sea level on the edge of the fjord. We rode the 20 miles or so to a dead end at the ferry crossing near Hella. The walls of the mountain rising up from the sea were to our right on the way out, and we passed several waterfalls and tiny towns. Forced to turn around (we didn’t want to take the ferry across the fjord), we retraced our steps until we decided to head up a switchback that climbed the mountain. The paved road quickly turned to unpaved, muddy switchbacks that took us to higher elevations at a rapid clip. The big Tenere was in its element as its long travel, electrically adjustable supension did its job. I started to have some fun pushing the pace, and Evan fell a short way behind on the FZ-07. Eventually, the snow line made us turn around and return to the 55 highway. A tongue of the awesome glacier near Fjarland. The weather remained gloomy and damp during our stay in Sogndal, but despite this we ventured out on the bikes each day, and enjoyed the beautiful scenery and generally well-maintained roads (with frequent tunnels through the mountains). Traveling North on the 55 one day, we rode up and down a twisty side road that led us to the ferry crossing at Solvorn (see map). This is the only road we found dry enough during this part of our trip to ride hard through the corners, and explore deeper lean angles. For this reason, we went up and down the road more than once. 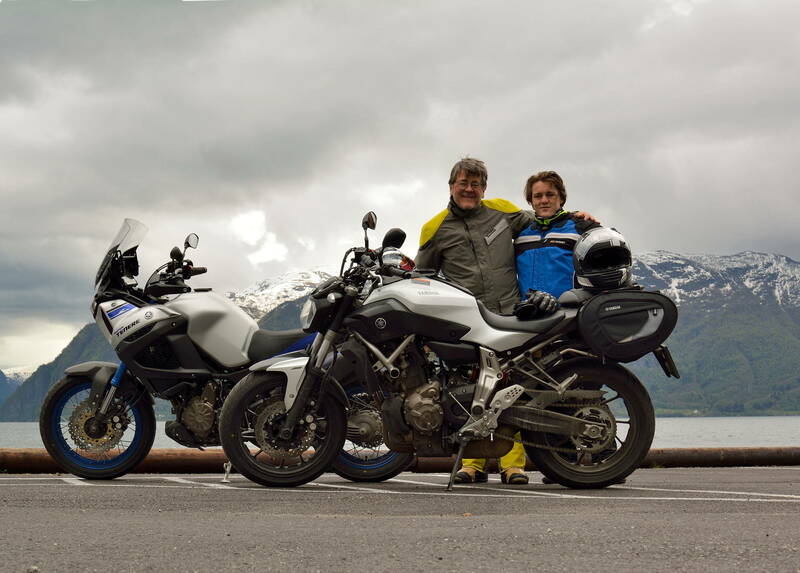 Not surprisingly, Evan had no problem hanging on to the back of the big Tenere aboard the nimble FZ-07. When it was time to leave Sogndal, we were advised that the mountain pass we used to come out to the fjordlands (the E16) was closed, and we would have to travel back to the east coast (where Oslo is located) on the 52 highway. Evan and I packed and topped off the bikes’ fuel tanks the evening before, so we could get an early start. We were prepared to stop and spend the night roughly 1/2 way to the east coast, depending on the weather and our comfort on the bikes. Traversing a different mountain pass had me concerned. Off the E16 South of Honefoss. After cleaning up our comfortable apartment, we jumped on the bikes and proceeded east on the 5 highway, crossing the fjord on the ferry, and linking with the E16 before turning right on the 52 to cross the mountains. Typically, the day started cold and damp, but fortunately the rain wasn’t too heavy. After keeping a roof over our heads on the ferry to stay dry, the weather progressively improved and we entered the mountain pass with patches of blue sky. Crossing the mountains on the 52 turned out to be a quicker, and easier route than the E16. It also appeared to pass at a lower elevation. Although we still reached the point where we were surrounded by snow and ice, overall this was a much easier, more comfortable day on the bikes. I would estimate the air temperature was just above freezing (high 30s Fahrenheit) at the coldest point, but we seemed to get over the pass and into the lower elevations relatively quickly. Evan toughed it out on the FZ-07 until I pulled over to check on him halfway through the mountain pass. After telling me he was fine earlier, he quickly agreed to take a respite aboard the Super Tenere, with its wind protection and heated grips (I knew he was cold at this point). Highway 7 East of Gol. When I rode the FZ-07 down the other side of the mountain, its nimbleness in comparison to the Tenere was very enjoyable. This was the trade off – relative warmth and comfort of the big bike, versus the grin-inducing quick reflexes of the little bike. Fortunately, the weather began to improve, both in terms of temperature and moisture, as the elevation dropped. I was quickly happier aboard the nimble FZ-07, and enjoying the dry twisty roads. 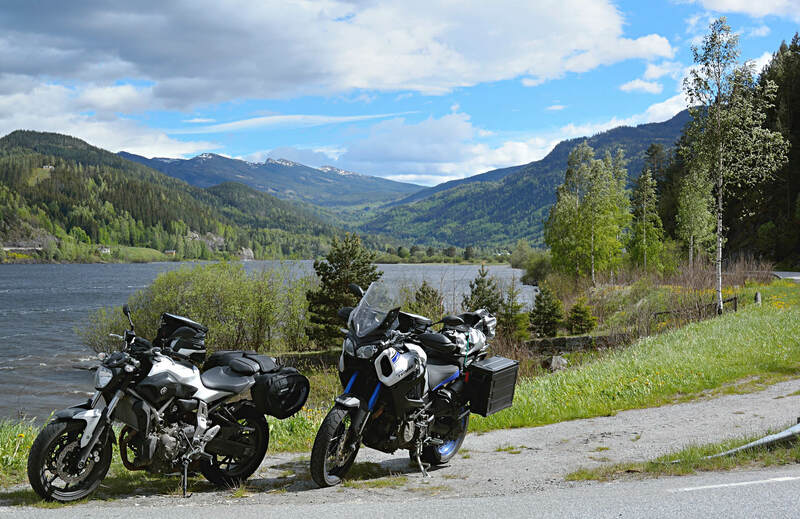 With the improved weather, and our early start, we pushed on past a couple of the towns we thought we might stay in that evening, including Hemsedal and Gol. After lunch in Gol, we took highway 7 south, and it lived up to its reputation by offering stunning vistas nearly the entire distance to Honefoss. There, we finally parked the bikes and stayed at a hotel relatively close to the next day’s destination, Sandefjord, where we would return the bikes to Speed Motorcenter. It was nice spending the evening in a hotel without having to spread out our riding gear to dry. Dirck and Evan take a break near Sogndal. That evening, we could feel the end of our trip nearing, and it was bittersweet. We had done some suffering on the bikes, but this somehow made the experience more gratifying. It was a great experience doing this trip with my son, but I would soon leave him to explore other parts of Europe as I returned to Southern California and my home with his mom and our two Labradors. Riding near the east coast the following day, we expected dry and warm weather, for a change. This is exactly what we ended up with … somewhat ironic that it was our final day on the motorcycles. 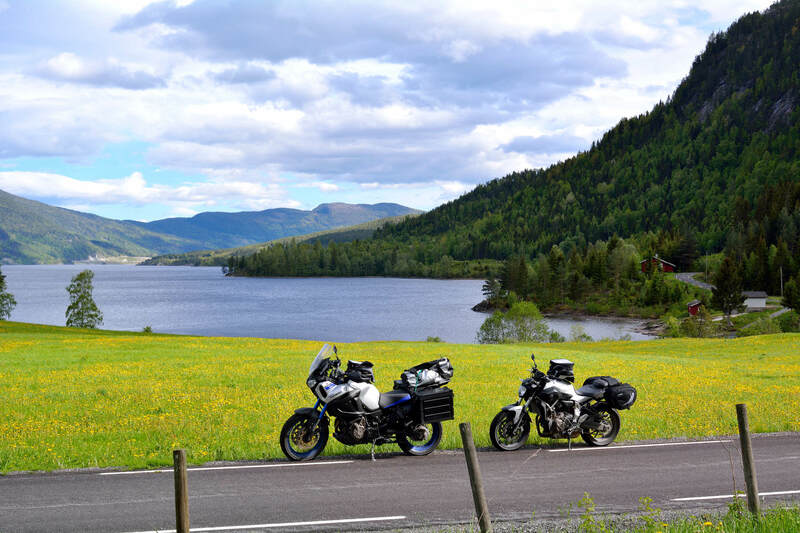 On our way to Speed Motorcenter, we stopped in Drammen, a town near Oslo that we found charming that first day on the bikes. One of countless waterfalls cascading into a fjord just a few feet from the highway. 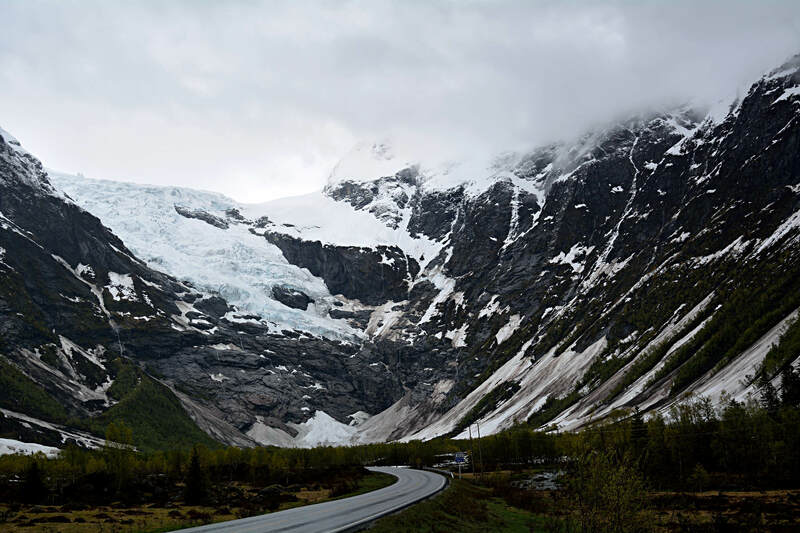 This one on Highway 55 South of Sogndal. Rather than stop under the shelter of a parking garage as we had done the first time we visited Drammen, we rode under a sunny sky directly to a Starbucks coffee shop. It was nice to briefly take off our gear and sink into the big leather chairs with a warm mocha. We actually dropped a couple of layers for this trip, as we were getting too warm. Imagine that! We then took the relatively boring E18 south to Sandefjord to meet our new friend Terje Bredal at Speed Motorcenter. Terje had promised to give us a tour of Sandefjord and the surrounding area. 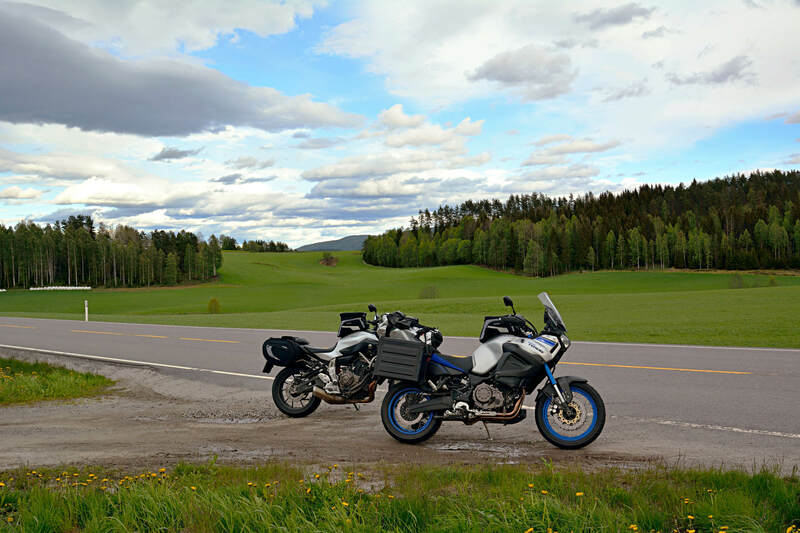 After some chitchat about our trip, incuding Terje’s announcement that the local news labeled this May the coldest in Norway in 36 years, I jumped on the FZ-07 and Evan took a demo FZ-09 as we followed Terje on his personal Super Tenere for a tour of the neighborhood. Sandefjord is a beautiful coastal town, with a lot of Viking history. Terje didn’t hesitate to ride aggressively as he led us on dirt trails to a peak overlooking the city, and then sliced through traffic on the highway and city streets. Evan got a good taste of the power of the triple while blasting around cars to keep pace with Terje. Late that afternoon, we caught the train north to Oslo where we would spend the night before sightseeing on the last full day of our visit. 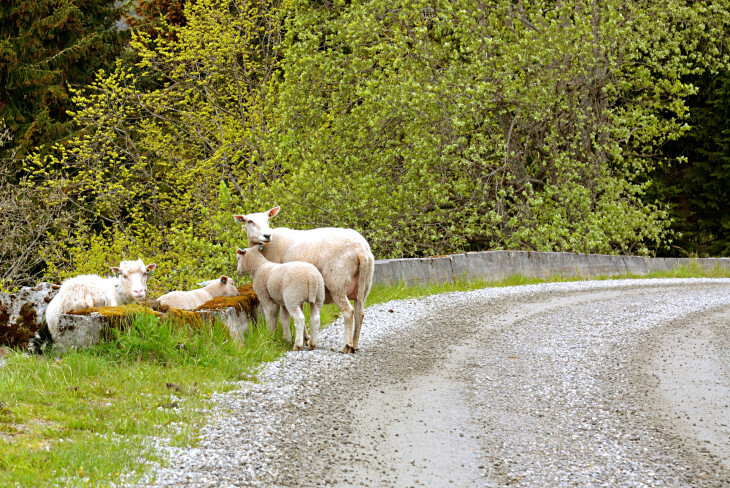 One of many groups of sheep and goats encountered on the switchbacks leading up a mountain near Sogndal. This is a good time to talk about Norway, in general. The ability of the locals to speak English well was a nice surprise. I pointed out earlier that Norwegians are taught English from the 3rd grade. This made our entire trip so much easier, because the Norwegian language, for me at least, is extremely complex. Even if you see a Norwegian word, getting the pronunciation even remotely accurate can be difficult. The infrastructure of the country, including roads and public transportation, is impressive. As soon as we got off the plane at the Oslo airport, the cleanliness of public restrooms was striking. It was quite rare to see trash discarded on the street or anywhere in the countryside. Maintenance crews for the roads are everywhere, and I understand that snow is cleared from all of the significant highways and roads on a daily basis before commuters take to them. This appears to be a well-run country that doesn’t take its wealth for granted. Speaking of wealth, Norway is arguably the most wealthy country on the planet, with a national wealth fund significantly larger than that of Saudi Arabia or other oil producing countries. As such, Norway can easily afford the free services offered its residents, including free healthcare and education (through the university level). 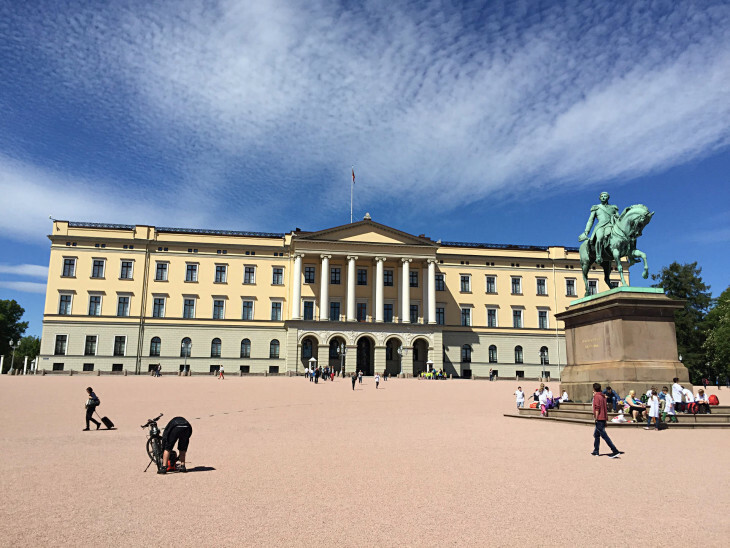 The back side of the Royal Palace in Oslo. Acres of gardens are open to the public for picnics, etc. Norwegians tend to be somewhat reserved, and quiet with strangers, but as soon as you engage them in conversation, they display warmth and a willingness to assist you. They love the outdoors, and are understandably proud of their beautiful country. As I mentioned earlier, even the very small towns we would pass through appeared well-maintained and clean. Given the harsh environment, it was clear that a fresh coat of paint, for instance, was applied to both residential and commercial structures with regularity. Careful to preserve their environment, our host in Sogndal, for example, took efforts to explain to Evan and I how to use the three disposal bins in the kitchen – sorting our trash. E16 Highway South of Honefoss. 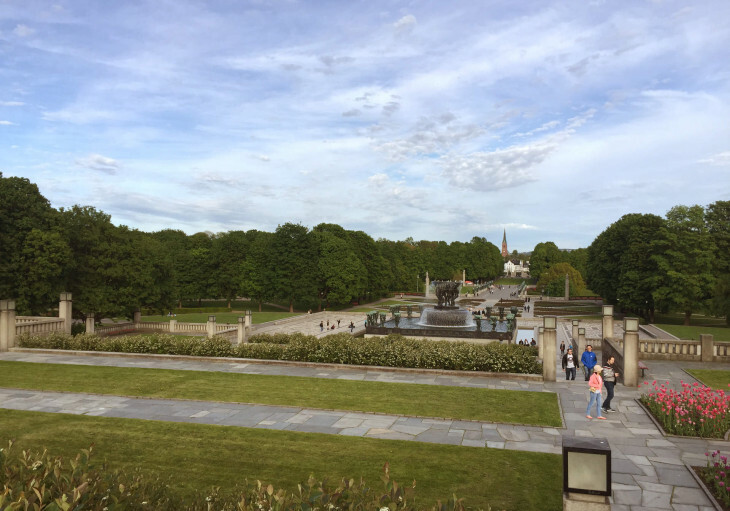 The city of Oslo seems somewhat divided between a less affluent area, and the end of town near the Royal Palace where we saw Rolls Royces, Bentleys and Mercedes zipping through the streets, beautiful apartments and homes, and gorgeous parks. Both sides of town, however, seemed relatively well maintained and clean despite the advanced age of many of the buildings. On my flight home from Oslo the next day, I sat next to a young woman holding an infant who was born in the United States but married a Norwegian and lived near Oslo. She told me she was returning to California to visit her parents, and she was in the middle of her one year paid maternity leave. Norway is quite expensive when it comes to food and hotel accommodations, but its workers are well paid and receive excellent benefits. 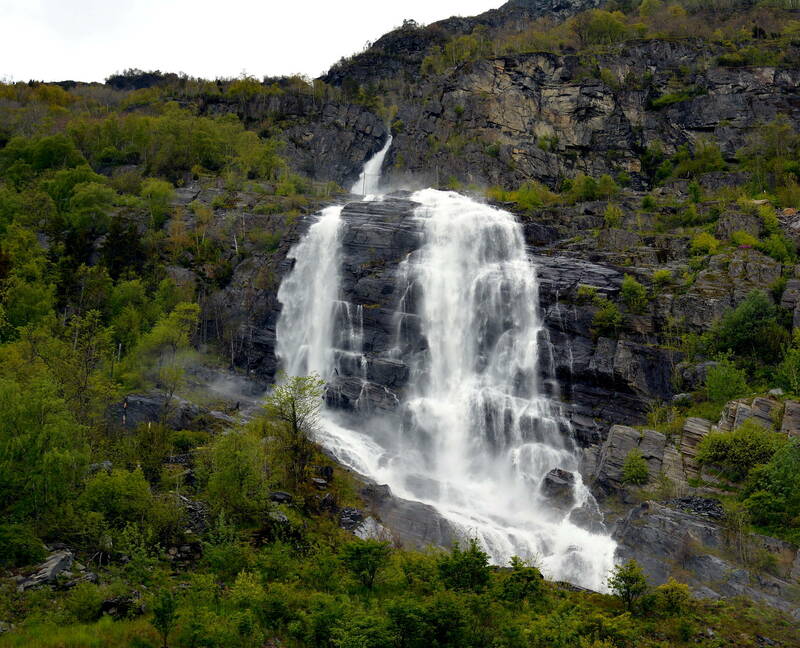 The lasting impression left by Norway is its striking natural beauty. It is pristine, and the work of the ancient glaciers moving through the land has left a picturesque landscape that no artist can hope to rival. I will return. Massive Vigelandsparken Sculpture Park, Oslo. For a reason I can not explain….I decided to wait for three parts of your travel story to appear ….then read them all at once. Nothing prepared me for the beauty of Norway …wonderful pix, but it was the details in your story to I enjoyed the most, because for many of us including me, we will never get the chance to visit Norway and it was the specifics that had me there with your son and you….every day, every mile. So thanks for taking me along with both of you…..but ohhhh for the chance to hang up the wet riding gear and actually be there with both of you ….just that one next day. You just made my day. Thanks. Great trip report. . We have just relocated to Norway from Houston Tx April 2015, so I can concur that May was bloody cold in Oslo..
You guys have Norge blood in you for sure. I wish my father did cool stuff like this with me when I was Evan’s age. Thanks for sharing this beautiful experience with us Dirck. Would love to see a map showing all the roads you covered! I’m trying to compare your notes to google earth now. Great reports. It has always seemed to me that the adventures most remembered and related to others had some areas of discomfort associated with them. Great piece. Thanks also for the HD photos which can be expanded to full detail on a large screen. Simply beautiful! Having taken photos for MD from its beginning, I grew to love photography almost as much as riding motorcycles. Quick question: the saddlebags on the FZ-07 look like Yamaha-branded versions of the SW-Motech “Blaze” bags. Can you say anything about how they performed on your trip? I’m considering buying a pair. Worked extremely well. Evan might have more to say, but they are well made and even expandable. They fit very snug and secure for soft bags, and the zippers held up to aggressive overstuffing of them. What a great adventure. So many cool elements. (Though I found myself wishing a few degree warmer weather for you!) Thanks for sharing, Dirck. Priceless. Best picture on MD ever. Thanks, Dale. I won’t argue with you. Taxes are currently at 42%. The Norwegians aren’t complaining. Why would you be bothered by it? It isn’t free, but everyone there has it and agrees it is worth paying for. Having lived in Austria for a while and drawing a parallel from the Austrians, I can also say that they are quite aware that things like free healthcare and free higher education aren’t free. But they are collectively willing to pay for it because they believe it makes for a better society and better life for people overall. From my experience, it is hard to disagree. When you add up federal, state, and local taxes, plus social security and medicare payroll deductions, U.S. residents pay more than that, without the same health (‘noticed average deductibles, lately?) and college tuition coverages. For the most aggressive profit-seekers, the U.S. works, but for the average guy, it’s a perpetual struggle just to keep up with inflation. It’s not 1980 anymore. I’ve been to Norway many times on business and for fun. An incredibly beautiful place with wonderful people. Norway also has the best distribution of wealth of any place I’ve ever been. Everybody appears to me to be middle class or above…no poor people. Yes its very expensive, but every body is well paid. Winter is hard, but In Summer, Norway can be the garden of Eden. And if you don’t like the weather, just wait 15 minutes and it will change. “Look, the Super Ten has the fancy painted wheels, not the FZ-07”. You’re the old dog. It’s a young guy’s world. Ride with him and show him how fast we get old. He won’t get it until he’s our age. Great trip, one you and your son will cherish forever, and what a beautiful country. Never even considered touring Norway. My bad. Congrats and thanks so much for sharing it with us.